It’s always been a big issue to select a high paying Ad network for your website or blog, but there are many Networks that can give you high eCPM rate. Lots of people are searching for Adsense Alternatives because getting an Adsense account is much harder now. 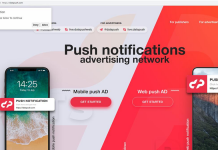 RevenueHits is an Israeli-based ad network founded in 2008, owned and operated by MyAdWise Ltd. RevenueHits is the best network for publishers who want to generate more revenues with state of the art Contextual & Geo targeted Ad Serving technology. RevenueHits provides self services for publishers, where any webmaster can come and get tags and start making money. They also offers a self service for Advertisers, where anyone can come and buy very high quality traffic. Bottom line – if you want to take your website or blog’s income generation to the next level, this is the best solution around. 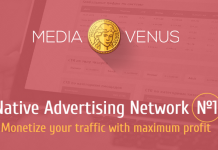 RevenueHits is the best ad network for monetizing websites. 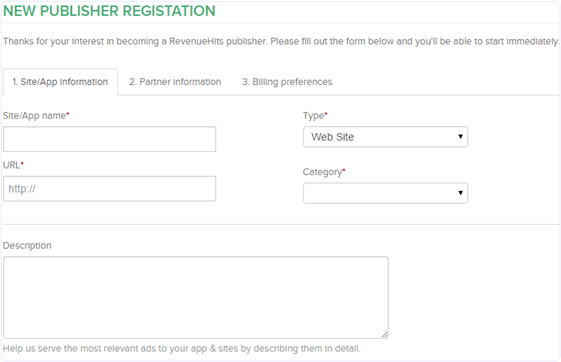 1) Go to RevenueHits.com and sign up as a publisher if you want to advertise on your website or blog. If you want to advertise with RevenueHits, click the “advertisers” button and sign up as an advertiser instead. In this guide, I’ll show you how to join as a publisher. 2) Now click on Sign Up to become a publisher. 3) The first tab is Site/Application Name. Here you have to provide complete information of your website or blog. ii. Select the type of your website. iii. Next add the URL of your website. iv. In the Description field, write a description of your website and click on the Continue button. 4) In the Next tab, select a username and password, and write your first name, last name, phone and Skype ID. 5) After filling the details, click on the Continue button. 7) After selecting your mode of payment, click on the Continue button. You’ll then see a popup message asking you to accept the site’s terms and conditions. That’s the simple process for publishers. After that, log in to your account with the username and password you selected to create ad units for ad placements. 1) At top bar, click on Placements. Placement name: Enter a unique name for the placement. Use something descriptive, like “homepage” etc. On Site: If you have many sites, select a specific one on which to show this ad placement. Placement/Tag Type: Use the drop down menu to select any of the many ad types available. Size: RevenueHits offers many ad size options. Choose the one that best fits your website’s needs. Description: Describe the website are you’ve designated for this ad. Click on save and you’ll receive a tag code. Copy the tag code and paste it where you want it the ad to show up on your site. Signing up for RevenueHits is so easy, anyone can join. This ad network is all about helping you make extra money with your website or blog and we highly recommend you check it out. Have you used RevenueHits to increase website revenue? Share it with us in the comments.